NEW YORK, Oct 24, 2013/ — Calvin Klein platinum label was launched in Asia with a special runway show featuring the men’s and women’s Spring 2014 lines this evening at Shaw Studios in Hong Kong. The contemporary bridge sportswear line was presented by Kevin Carrigan, the brand’s Global Creative Director. Top models, including Liu Wen, Tilda Lindstam, Soo Joo Park, Cici Xiang, Ehren Dorsey and Ju Xiao Wen; as well as male models Tim Schumacher, Sung Jin Park and Zhao Lei were featured in the runway show. Ms. Wen and Mr. Park currently appear in the brand’s Fall 2013 global advertising campaign. Editors and special guests from all over Asia were in attendance, and those who were wardrobed in Calvin Klein platinum label, included Du Juan, Tao Okamoto, Gaile Lai, Fiona Sit, Nicole Warne, Ana R., Anthony Sandstrom and Jocelyn Luko; celebrity stylists Alvin Goh and Ricky Kwok; fashion columnist Janice Wong; blogger and stylist Tina Leung; as well as socialites Anina Ho, Yvette Yuen, Yolanda Choy and Tess Ma. Photographer, blogger, and model Hanneli Mustaparta, who is a contributor to Calvin Klein’s official Tumblr blog (calvinklein.tumblr.com), was also on hand to capture the event and was wardrobed in Calvin Klein platinum label. 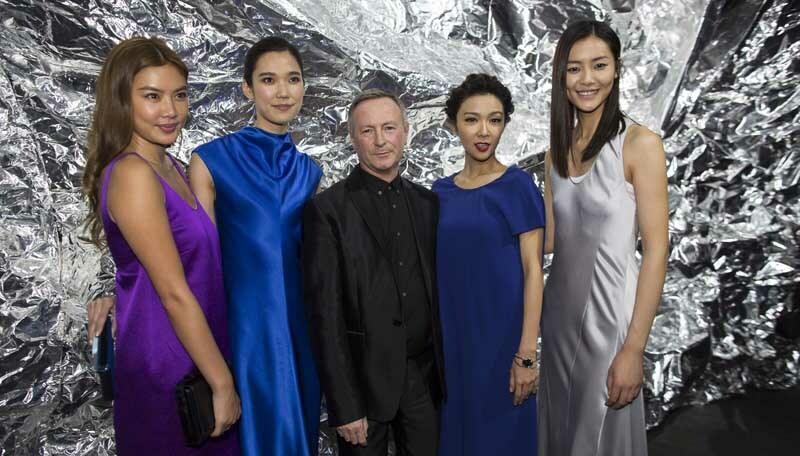 Representing the Asian debut of Calvin Klein platinum label, the Spring 2014 line was uniquely presented at Shaw Studios in the presence of a massive, custom, structural Mylar backdrop that reached approximately 150 feet wide and 20 feet tall. The show introduced the brand’s new, more sophisticated point of view highlighting contemporary shapes and innovative fabrics. Updating the house’s signature Minimalism with an athleticism and urban attitude, silhouettes were pared down, yet modern and edgy. Fabrics included an assortment of natural fibers and technical materials, while the color palette featured a mix of neutrals, accented with both soft hues of blush and ice pink and a bold counterbalance of viridian green. Complementing accessories played with texture and shine and continued the sporty vibe. Makeup for the runway show was provided by ck one color cosmetics, which launches in Asia this fall. Leading the team of makeup artists was ck one color cosmetics global makeup artist, Jodie Boland. The current ck one color cosmetics global advertising campaign for Fall 2013 features Ms. Lindstam and Ms. Dorsey. As previously announced, the global roll out of the brand’s name change from ck Calvin Klein began in Fall 2013 with watches and jewelry. The brand’s latest styles – including the timeless, sophisticated ck exceptional watches for him and the smooth, luxurious ck crisp jewelry for her, as well as other stylish new additions to the Spring 2014 offering – were also featured in the runway show. It is planned that the rebranding in Europe of the men’s and women’s bridge apparel lines will follow the Asian introduction, in a phased manner over time, beginning in 2014.